The opening plate of Modern London, showing the city as seen from the Royal Observatory at Greenwich. NO apology can be requisite for presenting to the world the History and Present State of the British Metropolis, at a time when the English language is destitute of any modern work of adequate consequence on the same important subject. The present publication addresses itself, in a popular and inviting form, to foreigners who may wish to convey to their respective countries correct ideas of London; and it also recommends itself to Englishmen, who cannot find in Stowe, Maitland, or Pennant, those facts relative to the actual present state of their Metropolis with which they may desire to become acquainted. It is obvious that Stowe can be interesting only to the antiquary; that Maitland is at once too antiquated and prolix for general reading; and that Pennant is rather a collection of detached anecdotes of persons and places than a systematic history of London. Each of these works have, however, their peculiar worth; but they are not adapted to the views of general readers, nor do they exhibit London as it is. But whatever may be the merit of those authors, their works have long been out of print, and they are only to be bought occasionally at a high price. It has, therefore, been a defect in the literature of the country, that no adequate work existed which described this great Metropolis, with the exception of the small Guide, lately published under the title of The Picture of London. The great success and high character, both at home and abroad, of this latter work have given birth to the present. In fact it has served as the skeleton upon which the present work has been formed. In point of correctness and variety, it answers every purpose of a pocket companion; but, from the necessary scantiness of its details, its confined embellishments, and limited size, it is unworthy of being the only book which describes the British Metropolis. Besides enlarging and improving all that relates to its present state, a History of London has here been prefixed, which has been compiled from the best authors and from original mss. by a distinguished antiquary. As Phillips readily admits, Modern London was founded on the text of another volume he had published, John Feltham’s hugely successful The Picture of London, first issued in 1802 subtitled ‘a correct guide to all the Curiosities, Amusements , Exhibitions, Public Establishments, and remarkable Objects, in and near London; with a collection of appropriate tables’. The Picture went through a series of annual editions and revisions over a number of years and its formula was imitated by several of Phillips’ competitors. Feltham’s volume described itself on the title page as being ‘for the use of strangers, foreigners, and all persons who are not intimately acquainted with the British Metropolis’, sharing with Modern London and with Rudolph Ackermann’s later Microcosm of London the aim of bringing London to life for those who were unfamiliar with its sights and rhythms, allowing them to acclimatise themselves to its particularities and thereby teaching them to act appropriately when discussing the city or when later encountering its realities.4 The ongoing success of Feltham’s five-shilling book and its successors made it clear to Phillips that there was likely to be a demand for a treatment of the same subject targeted towards the upper end of the market. While Modern London was considerably cheaper than the lavish Microcosm, its three-guinea cost still represented a significant investment. Feltham’s book was a close-typed duodecimo, but Modern London was a substantial quarto, with large text and wide margins. Feltham’s book had included a small number of plates, but Modern London included two extensive series: twenty-two black-and white plates of major scenes and landmarks, mostly engraved from designs by the Welsh artist Edward Pugh, and thirty-one coloured illustrations ‘representing the itinerant traders of London in their ordinary costume’ depicted in ‘remarkable places’, engraved from designs by William Marshall Craig. While neither of these artists were established leaders in their field, both were respectable. Craig held several positions with connections to royalty and both artists exhibited paintings at the Royal Academy’s summer exhibitions, occasions which Modern London describes as being ‘entitled to the first notice’ among the capital’s public art events.5 Whereas Feltham’s guide was a relatively nondescript and practical book, suitable for slipping into one’s pocket, Modern London was a book for the table or the armchair, a volume to be viewed and dwelt over rather than consulted. The book opens, as many modern city guides do, with a history and a general description, which includes information on distances, population, climate and consumption. The third chapter, on manners, also has a lot in common with modern tourist guides, seeking to explain customs and to give an abstract of the city’s particular character. However, differences become apparent in the chapters which follow. In Modern London, there is a notable focus on charitable institutions, the component parts of the legal system and on the major centres of commerce and trade. Some of these institutions contained the sorts of sights which modern tourists might travel to see – the Foundling Hospital displayed a number of original works by William Hogarth and the Painted Hall at what was then Greenwich Hospital is still open to visitors today. However, their inclusion also reflects the interest which Modern London takes in the civic makeup of the city. Its primary focus is more on how the city functions than on what a visitor can do in it. A quick and dirty word frequency analysis using Voyant reveals an interest in the types of buildings whose names double as markers of families or institutions (‘office’, ‘court’, ‘house’, ‘hospital’), a concern with the relations which bind together the city’s inhabitants (‘public’, ‘society’, ‘general’, ‘persons’) and a preoccupation with London’s status as the enduring focal point for British social hierarchies (‘lord’, ‘royal’, ‘king’). The word ‘great’ is also used a great deal, probably in part due to its prominence in street names, but also to make claims about London’s scale and preeminence. Romantic London does not at present feature the full text of Modern London (although those interested can download scans of the whole book for free from the British Library website). Instead, it focuses on the two series of plates which the book contains and the pages of descriptive texts which it provides to contextualise these. The plates can be seen mapped together onto the same map, on separate maps (landmarks/trades) or in galleries (landmarks/trades). The three maps include the full descriptions from Modern London as popups on individual markers and as sequences below the control boxes. There are twenty-two plates of scenes and landmarks interspersed through the main text of Modern London. Twenty of these are taken from designs by Edward Pugh, while the remaining two – exterior views of St Paul’s and Westminster Abbey – were drawn by Samuel Rawle, who went on to become a noted topographical illustrator.10 These black-and-white images cluster around particular points – Greenwich, Westminster, the centre of the City of London – and depict both major vistas and particular human occasions. In a article on the representation of leisure and of ‘untroubled social mixing’ in Pugh’s contributions, John Barrell contends that he ‘offers us a different and much more benign take on modernity than does the text of Modern London‘.11 Pugh’s plates present the people of London interacting and relaxing in ways which contrast with the relative starchiness of the main text, which focuses principally on the contents and functions of the buildings it describes rather than on the many lives which pass through them. Pugh’s figures are by no means as wild and sharp as Rowlandson’s equivalents in the Microcosm, but they succeed in peopling London in ways which the chapters of the book, concerned as they are with order and commerce, often fail fully to achieve. While the text reaches for general truths, the images, by their nature, must specify. The thirty-one plates of itinerant traders by William Marshall Craig strike some telling contrasts, placing some of London’s least wealthy salespersons in some of its most exclusive squares. While not as accomplished as Pugh’s plates, these coloured images of particular tradespeople reveal a great deal about how the city functioned in the days before supermarkets and department stores, memorialising the specific human labourers who formed indispensable and colourful parts of its ecosystem. The texts celebrate the ways in which London’s traders supported its sights and institutions, but also encode anxieties about the fairness and equability of these arrangements. 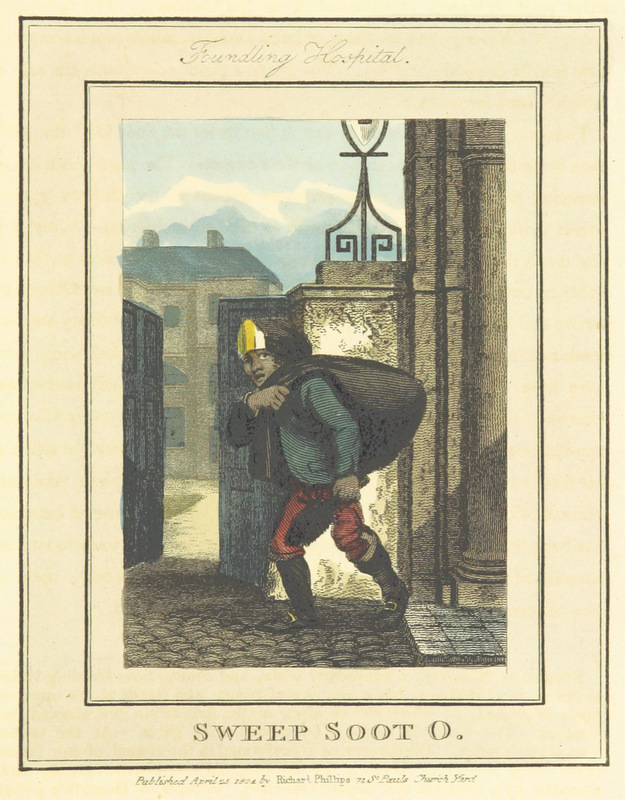 While the Foundling Hospital is unreservedly commended, the details given of the poor chimney sweep in front of it make it clear that charitable systems can by no means be entirely effective in alleviating the struggles of London’s poor. Modern London presents a largely positive image of the metropolis, but is honest enough to reveal some of its tensions. [Richard Phillips], Modern London; being the History and Present State of the British Metropolis (London: Richard Phillips, 1804), pp. iii-vi. The identity of the ‘distinguished antiquary’ who wrote this account has not definitively been ascertained; John Barrell advances an argument for the Welsh antiquarian David Hughson in ‘Edward Pugh in Modern London’, The London Journal, 37.3 (November 2012), 174-95 (p. 175). [John Feltham], The Picture of London for 1802 (London: Richard Phillips, 1802). A copy of this volume can be seen on Google Books. See Austin Dobson, ‘Craig, William Marshall (d. 1827)’, rev. Annette Peach, Oxford Dictionary of National Biography (Oxford: Oxford University Press, 2004), <http://www.oxforddnb.com/view/article/6583> and Peter Lord, ‘Pugh, Edward (bap. 1763, d. 1813)’, Oxford Dictionary of National Biography, <http://www.oxforddnb.com/view/article/6291>; Modern London, p. 468. Picture of London for 1802, p. 349. Modern London, pp. 473, 474. B. Hunnisett, ‘Rawle, Samuel (1775/6–1860)’, Oxford Dictionary of National Biography (Oxford: Oxford University Press, 2004), <http://www.oxforddnb.com/view/article/23182>.